The long-term performance of prediction scores for venous thromboembolism (VTE) in cancer patients has been poorly investigated. We evaluated the discriminatory performance of the Khorana, PROTECHT, CONKO, and ONKOTEV scores for the first 3–6 months and for 12 months, and re-assessed scores after 3–6 months to determine the influence of variations in patients’ risk classification on performance. Retrospective cohort of ambulatory patients with active cancer who were scheduled to receive first or new line of chemotherapy. The primary outcome was symptomatic or incidental VTE. A total of 776 patients were included of whom 540 (70%) had distant metastases. The time-dependent c-statistics of Khorana, PROTECHT, CONKO, and ONKOTEV scores at 6 months were 0.61 (95% CI 0.56 to 0.66), 0.61 (95% CI 0.55 to 0.66), 0.60 (95% CI 0.54 to 0.66), and 0.59 (0.52 to 0.66), respectively, with a tendency to decrease during follow-up. None of the scores discriminated between high and low risk patients at the conventional 3-point positivity threshold. The use of a 2-point positivity threshold improved performance of all scores and captured a higher proportion of VTE. The accuracy of risk scores re-assessed at 3–6 months was modest. The Khorana, PROTECHT, CONKO, and ONKOTEV scores are not sufficiently accurate when used at a conventional threshold of 3 points. 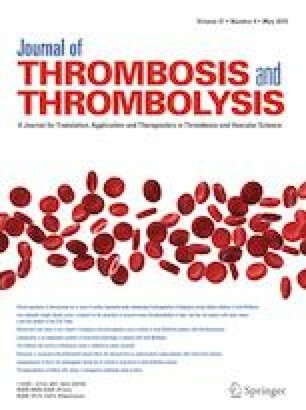 Performance improves at positivity threshold of 2 points, as evaluated in recent randomized studies on VTE prophylaxis. Score accuracy tends to decrease over time suggesting the need of periodic re-evaluation to estimate possible variation of risk. The online version of this article ( https://doi.org/10.1007/s11239-019-01845-6) contains supplementary material, which is available to authorized users. Concept and design: MDN, EP. Interpretation of data, critical writing or revising the intellectual content, and final approval of the version to be published: MDN, NvE, LR, NA, LF, MDT, CN, NT, IC, EV, MC, AWSR, EP. None of the authors have potential conflicts of interest to declare in relation to the current work.